The insects and pests that are found on the East End of Long Island are myriad. And Nardy's technicians are ready to treat any problem that might arise. To the right, you'll find interesting information about our "local inhabitants" and maybe even something that is crawling around your house! Eeeww! Note: For infomation on vertibrate pests, including rats, mice, and squirrels, click here. Each pest control situation we take on is analyzed and a course of action that will most effectively treat the pest is taken. We use non-toxic baits and gels more and more as their technologies become more advanced and effective. IPM is an integral part of our technicians' pest control arsenal and is explained below. 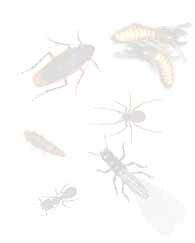 Nardy utilizes the best pest control techniques which include the experience gained over many years of fieldwork combined with the lates in IPM practices. We use Integrated Pest Management (IPM) in our practice in order to apply the least amount of pesticides while still closely monitoring and controlling your pest populations. Many of our customers bring in specimens of insects they find around their property so our experienced staff can identify the exact pest "bugging" you. With more than 250 years of combined industry knowledge, there is no guessing when it comes to what pest we are treating, and we are able, therefore, to provide you with the most effective pest control service.